I often fidget about shorter posts, thinking it might suggest negligence or laziness, but I forget that there are times when brevity better suits the occasion, and when products speak well for themselves, there really isn't much else needed to be said. One such product is the Fresh Sugar Lip Treatment SPF 15. I've tried both Honey and Passion and I've been thinking about the Rose and regular versions ever since. The Fresh Sugar Lip Treatments are lightweight balms housed in a sturdy lipstick canister. It differs from regular packaging in that you have to twist the cap to access it. There is no chance that the cover will dislodge in your bag - always a plus. 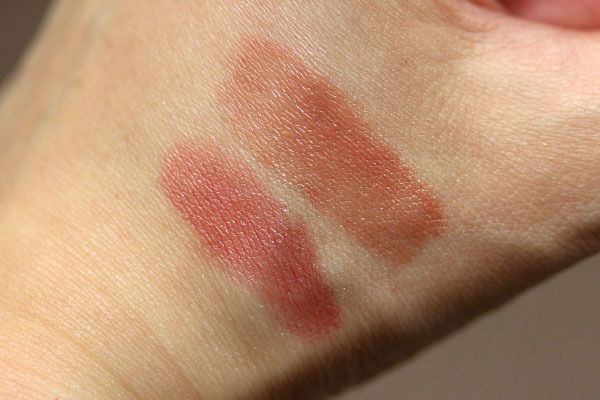 In one of my very first posts on Messy Wands, I mentioned that I used to be highly sensitive toward lip products. While the (unknown) allergies have since subsided, occasionally it still rears its ugly head. Burt's Bees and Chapsticks don't do well on my lips, even the oft-raved-about Jack Black Lip Balm tends to make my lips swell when left on overnight. I've had no problems with the Fresh balms. They work as they should, are tasteless, and while there's a slight odor to the bullet it doesn't linger on the lips. I don't find that frequent re-application is needed. The two that I have give me an extra pop of color, which I like. Those who prefer colorless balms can choose to explore the original version. I couldn't recommend them enough. Fresh Sugar Lip Treatment SPF 15 retails for $22.50 and is available at Fresh freestanding stores and Sephora. I absolutely love these! Got the Lemon and Rose and they're fab! You and Larie are definitely making me want to try the Sugar Lip Treatments! Love that they both have a hint of lip colour, I'm a sucker for tinted lip balms/conditioners :p.
you look beautiful with the passion! I want the Honey one, now! And weird - I also have the same reaction to the Jack Black balms, and the Burt's Bees chapsticks, as well as some other balm/gloss type products. I still haven't figured out what ingredient it is, but then...I haven't really spent that much time checking it out. Oops. Jamilla- :) There's a lemon flavor at your place?? That would be interesting. I love those. I have all, except Honey, cause it's to warm for me. Both Original and tinted give my lips good treatment. From all the colors I prefer Rose. It actually looks like Passion on your photos and Passion itself is much more red on my lips. That is why I can't really wear it as a balm - puts too much attention to the lips and face. i love honey and i had the regular one but seem to have lost it. I have a mini rose but was thinking passion was too dark but it doesn't look it from your photos! I'm excited to try it out! My favorite is plum! I loved it and lost it and I was so sad! But definately a beautiful color! Between you and Larie, I'll have bought all of these by the end of this month. And I will be broke (but probably very happy). The blame game is so fun!! We need to start a scoreboard. And... a new blog series has begun. Running with that idea!